HALBAN For his research on natural hazards in the Sultanate of Oman, the geoscientist Prof. Dr Gösta Hoffmann from the German University of Technology in Oman (GUtech), Department of Applied Geosciences, was awarded with the National Research Award of The Research Council (TRC) yesterday evening. Prof. Dr. Gösta received the Award from H.H. Sayyid Shihab Bin Tariq Al-Said. The award ceremony was held at the Shangri-la Barr Al Jissar Resort. “The award is an appreciation for our constant efforts to boost research at GUtech and in the Sultanate of Oman. We are very proud to have such a brilliant scholar like Prof. Gösta amongst us. This will encourage all colleagues to conduct research activities in Oman,” said Dr. Jürgen Werner, Deputy Rector for Academic Affairs at GUtech. Prof. Gösta was the principal investigator of a TRC project titled “Short- and long-term coastal evolution along the coastline of Oman”. The research team included Dr. Sultan Al-Yahyai (Public Authority for Civil Aviation, Dr. Ghazala Naeem (Disaster Risk Reduction Consultant & Architect, Resilience Group, Pakistan), Miss Mareike Kociok and Dr. Christoph Grützner of the Institute of Neotectonics and Natural Hazards at GUtech’s partner university, RWTH Aachen University in Germany. “In my view the greatest challenge is to combine research and teaching in Oman. Therefore, in the frame of the project, I take our BSc Applied Geosciences students to the field-work, so that they are part of the research and can experience state-of-the art technology. Therefore the students are at the frontier of science and innovation and it is a win-win situation for me as a researcher and teacher and the students,” said Prof. Gösta. “Oman is a natural laboratory we can use to test our research hypothesis,” said Prof. Gösta. The tsunami effects on the coastal zones in Oman were documented in a scientific paper which was recently published in the highly ranked, peer-reviewed scientific journal “Geology”. The Omani-German research team conducted their research analysis on rock deposits left behind in the past by tsunami as well as by storms when in September 2013 they were surprised by a tsunami wave in the middle of the project. “The tsunami reached wave heights of around 1 m at the Omani coast. We conclude on a submarine slide off Pakistan as the likely trigger mechanism” said Prof. Gösta. On 24 September 2013 a magnitude 7.7 earthquake occurred in Balochistan, Pakistan, the quake caused intense ground motions and had dramatic consequences – hundreds of people died, and more than 100,000 lost their homes. “A secondary effect which caught much attention in the international media was the birth of an island off the Pakistani coast – Zalzala Jazeera or Earthquake Island,” said Dr. Gösta. To document the tsunami effects in Oman the researchers interviewed local fishermen in Sharquiyah region and asked if they observed any strange wave behavior. “The interviews followed the UNESCO-IOC International Tsunami Survey Team (ITST) protocol. The Omani eyewitnesses reported unusual waves during low tide, a change of water colour during the event, retreating sea before larger waves approached, strong currents they hadn’t observed before, and an unusual large amount of fish they could catch the next morning. The fishermen were so impressed by the spectacle that they recorded several videos which can be found at paleoseismicity.org.” said Dr Gösta. “This tsunami was a very special earthquake environmental effect: An earthquake triggered a submarine slide, which in turn triggered a tsunami,” said Gösta. This kind of cascading effects is currently not included in any tsunami hazard assessments. 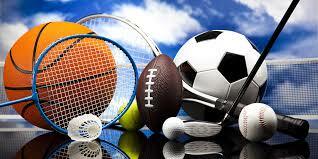 The study emphasizes the need to better incorporate such mechanisms in order to better protect the public. This tsunami study was part of a much larger research program on the coastal evolution of Oman led by Prof Dr Gösta Hoffmann (GUtech). More than ten scientists from six countries (including Oman, Sweden, UK, Germany) are involved in the project, studying the dynamic and changing coasts of the Sultanate. While being funded by TRC, the main foreign support comes from RWTH Aachen University, where Prof Dr Klaus Reicherter leads the Institute of Neotectonics and Natural Hazards. He and his team have provided equipment, knowledge exchange, and scientific support for the work in Oman. The team is currently supported by TRC in a new research project entitled “Quaternary sea level changes”. A great success is the exchange of international scientists and students, including from Oman. Since 2011, dozens of GUtech students visited RWTH Aachen University and more than 16 German students carried out research in Oman. Last summer, Prof. Gösta conducted a two week practical laboratory course on natural hazards for GUtech BSc Applied Geosciences students at RWTH Aachen University. In addition, two BSc students graduated recently by carrying out parts of their research at RWTH Aachen, for three months, co-financed by DAAD. His international research team of geoscientists is currently supported by TRC in a new research project entitled “Quaternary sea level changes”. “Research has started this year and we expect first results by the end of the year as the field season has just begone” said Prof. Gösta. Registration for the MSc Petroleum Geosciences is still open, on October 18th a new group of students will start. “Those professionals in the oil and gas sector who are interested in giving their career in the oil industry a boost are welcome to join the programme. Throughout the MSc studies the students conduct a number of field-trips in Oman and abroad and they are taught by academics who are internationally experienced in the oil and gas sector. “The MSc programme focusses on developing the student’s scientific research skills” said Prof. Wiekert. Most of our MSc students are pursuing their studies beside their work duties in different companies in Oman, such as PDO, Oman Oil, CCED, CGG. In addition to class room teaching, the theory and practice of Geosciences in the field and in our ‘Schlumberger workstation laboratory. GUtech is affiliated with RWTH Aachen University in Germany, one of the leading universities of technology in Europe. The MSc course in Petroleum Geoscience was designed by RWTH Aachen professors of the department of Geosciences. The MSc programme in Petroleum Geoscience at GUtech is recognized by the Ministry of Higher Education in Oman and uses the European Credit Transfer System (ECTS) to record student’s process. MUSCAT A group of Omani students and their professor of the Department of Petroleum Geoscience at the German University of Technology in Oman (GUtech) conducted a one week field-seminar near the largest onshore oil field in Europe, the Wytch farm oilfield, located on the south coast of the UK. “This is the most famous area in the world for teaching petroleum geology in the field. Our main objective was to explore the main processes that lead to the formation of an oil accumulation and to teach the students the so-called ‘play evaluation’,” said Professor Dr. Wiekert Visser, Head of the Department of Petroleum Geoscience at GUtech. The field work was lead by Professor Wiekert and has been held on an annual basis, as part of the three-year Master’s programme. The Southern coastline of the UK, especially the regions Devon and Dorset are renowned for their teaching possibilities in oil and gas exploration geology. 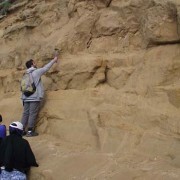 Such quality of teaching in petroleum geological is very hard in Oman because of the mountain building has distorted many primary rock quality features which are important for petroleum geology. “In the South of the UK the geological structure is very simple compared to Oman,” said Professor Wiekert. Besides GUtech, many oil companies and universities visit the Dorset coast for petroleum geological training. 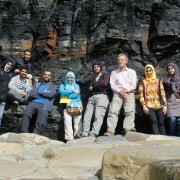 “During the seminar we worked together in small teams, and learnt how we can use observations on source, reservoir and seal rocks and structure in the field to derive the history of the rocks, which then helps to predict the potential for petroleum exploration” said Haifa Al Salmi, Assistant Lecturer at the Department of Petroleum Geoscience. At the end of the week long field excursion, the teams had to present their petroleum exploration concept to a senior explorationist.